This price includes insurance, all transport, accommodation and food in the village. Day 1: Pickup from Chiang Mai at 9am. Travel through a national park and stunning mountains inhabited by local hill tribes until you arrive in our unique village. Meet your homestay family, our friendly staff and the other volunteers, immerse yourself in hilltribe culture by cooking with your homestay and learning how to basket weave from one of the elders in the village. Day 2: Wake up early to hike in the forest and find our elephants. Feed them fruit and carry out a health check. Spend all morning/afternoon observing and learning about them and their natural behaviors. 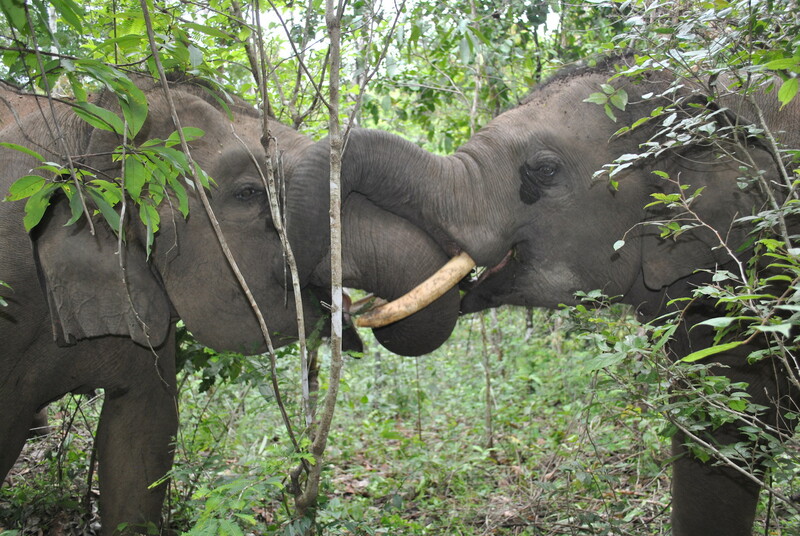 Have lunch in the forest with the elephants and return to Chiang Mai in the afternoon. Day 2: Wake up early to hike in the forest and find our elephants. Feed them fruit and carry out a health check. Spend all morning/afternoon observing and learning about them and their natural behaviors. Have lunch in the forest with the elephants. Return to the village late afternoon and take part in our community & teaching projects. Day 3: Another early start to hike to our elephants one last time. Return to Chiang Mai in the afternoon.